Sweden was one of the last countries to adopt a national day. Nationaldagen is the 6th of June and only became a red day (a day off from work) in 2005. There aren’t a lot of food associations with this particular holiday and many people in Sweden are surprised to learn there is actually a nationaldagsbakelsen (a national cake). The background for nationaldagen (NA-shun-NEHL-DAH-gun) begins at the turn of the 19th century when national romantic pride was sweeping the land. Museums and historical societies were springing up throughout the country and the first step toward nationaldagen was made by Arthur Hazelius, founder of the open-air museum Skansen and the Nordiska Museet, both which highlight Swedish heritage and culture. On 6 June 1892, Hazelius celebrated “Svenska flaggans dag” (Swedish flag day) for the first time at Skansen. His motivation for picking June 6th is that it marks the day in 1523 that Gustav Vasa was crowned the first king of Sweden, and in 1809 it marked the end of the Gustavian autocracy and adoption of a new constitution laying the groundwork for the current Swedish government. Steps toward a national day continued in 1916 when June 6th officially became Svenska flaggans dag. It carried the flag day name until 1983 when it transformed to nationaldagen. Since nationaldagen fever wasn’t quite taking off, in 2005 the government swapped out the Whit Monday holiday and made nationaldagen an official red day instead. The biggest celebration takes place at Skansen where the flag is raised and the king and queen receive bouquets of summer flowers from traditionally costumed children. In many of the larger cities celebrations are held with music and special ceremonies for new Swedish citizens. Aside from raising the flag, there aren’t strong traditions or food associations tied to nationaldagen so people seem to flounder a bit in terms of knowing how to mark the day. In efforts to remedy that, the Fruktrådet (fruit council) held a competition for a national pastry in 1994 and the winner was Helena Bergsmark of Café Gateau i Stockholm. 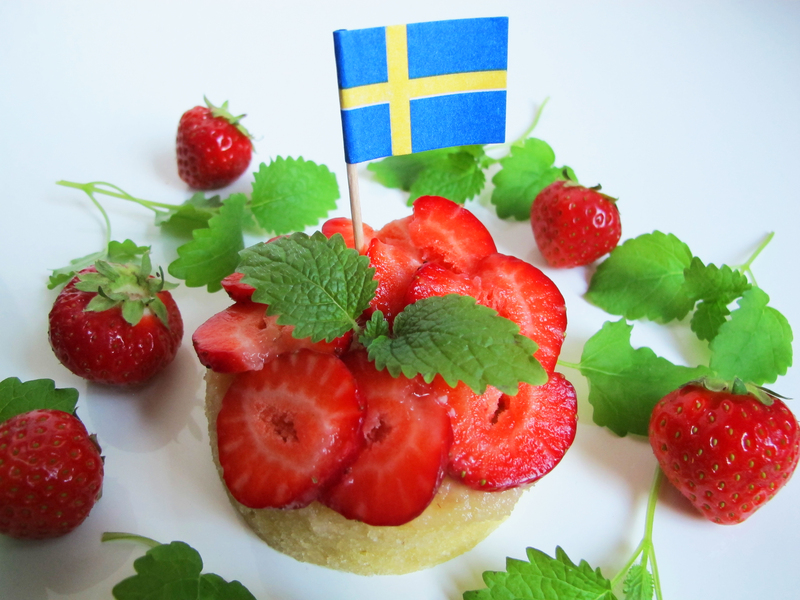 Her simple creation incorporates well-loved Swedish ingredients including almond paste and Swedish strawberries. It’s easy to make and very portable for summer outings and celebrations. It’s also gluten-free which is highly appropriate since gluten intolerance and Celiac Disease are rather common in Sweden. So if you aren’t quite sure how to celebrate Sweden’s national day and are too far away from Skansen to join the king and queen, at the very least you can raise a Swedish flag or try your hand at the nationaldagsbakelse. Tossing back some pickled herring and raising your glass wouldn’t hurt either. Skål! 2. Grate the almond paste with the small holes of a cheese grater. Cut the butter into cubes and add it to the grated almond paste. Work the almond paste and butter together with a fork or a food processor until incorporated. Add the eggs and blend everything well with a fork or food processor. 3. Place the batter on a cookie sheet lined with parchment paper. Spread the batter out in an even layer 3/8″ (1cm) thick. It doesn’t matter that the batter is free-form. Bake in the lower portion of the oven for 12-15 minutes. While it bakes the batter will start to thin out and it will look like it isn’t working but in the end it fluffs up and becomes spongey. When the edges are just brown and the middle is set, remove from the oven and let cool completely. 4. Grate the remaining almond paste and mix it together with the Grand Marnier. When the cake has cooled completely, cut it into squares with a knife or use a cookie cutter to cut out circles of cake (the original was actually oval). If your cake turned out to be too thin, just cut two circles and stack them on top of each other. Top the cut-out cake with a thin layer of the Grand Marnier and almond paste filling, sliced strawberries, and garnish with lemon balm. 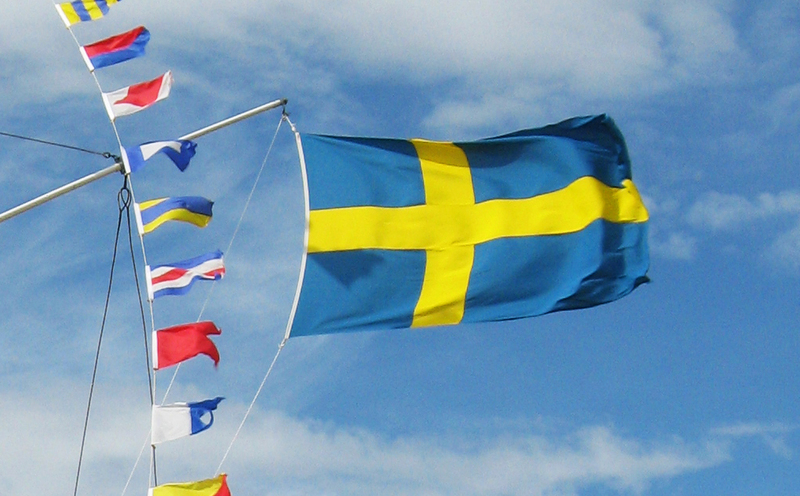 A Swedish flag is the perfect touch for celebrating nationaldagen. Our Swedish pennant is flying just below the US flag on our flagpole again this summer. Last summer someone drove into our driveway to ask why we had a Swedish flag! We had a great chat. They even came in for some iced tea. Now to try the cake….. The cake is so easy to do, you really should give it a try. I don’t think you’ll find it while you are on your trip here, but do get your fill of Swedish strawberries. You are coming at the perfect time for them. Thank you for sharing this wonderful culture and the gluten-free sweets. A very enlightening post and the recipe looks easy too! I might give it a try the next time I have the baking itch (provided I have the ingredients around). Thanks for sharing! If you keep some almond paste in your pantry, it’s easy to whip this up. And it would certainly work with other berries as well like raspberries, blueberries, or blackberries. I think out of season, or in a pinch, it could even be done with frozen berries that have been thawed. I’m sending this to my step dad who is half Swedish! We found this cloyingly, almost nauseatingly sweet and rather greasy (probably undercooked slightly) but the concept was such a good one that I had to tweak and try again! I found Almond flour in ICA and tried 150g grated almond paste, 150g almond flour and 150g grated butter mixed up with the three eggs. Lighter, fluffier and a nicely balanced taste, in my opinion. The family were not going to tolerate the rest of the almond paste with orange juice (though it went very nicely in my porridge this morning!) so I just served up tinned fruit of which I think the apricot halves were best, only really challenged by the sharp contrast of a pineapple ring … boys liked the mandarin segments though. Thought I’d share, especially as it is so useful to have a ‘sponge cake’ recipe for the gluten frees or wheat frees of my circle of friends – thank you Maia for the inspiration to experiement! I’ve lived in Sweden for one year now, and thanks to you I discovered this cake. Well, Nationaldagen is over, but certainly not sweet day! So I decided to make it, and it was sooooooooo yummy! (posted a pic on your FB page btw!) Love your blog so much! Plenty of good ideas. Keep on rocking! What a sweet comment. Thank you so much. I’m glad you enjoyed the cake. There is so much more I want to write about, but a new, full-time job is putting a big cramp in those plans. But I’ll do what I can to keep going. Thanks for the encouragement and taking the time to comment. You are so fortunate to be living in Sweden. My mother is from Sweden and I have only had the opportunity to visit once in my lifetime. I think its time to go back. Food is so wonderful, thanks for sharing your recipes. I will be back for more! I’m so excited to find these recipes!